Most people are unaware, that beside the normal browser cookies, new types of super cookies have emerged. These cookies are not deleted together with the browser cookies, and can be used through all browsers. Additionally, web bug cookies can be used to track you while browsing the internet and create a profile of your interests and habits.MAXA Cookie Manager provides you with the possibility to block any traffic to these sites. 5.Create and manage both white lists and black lists - Increasing productivity by keeping the cookies that you actually need! If you want to learn even more about cookies, then please take a look at our Whitepaper. 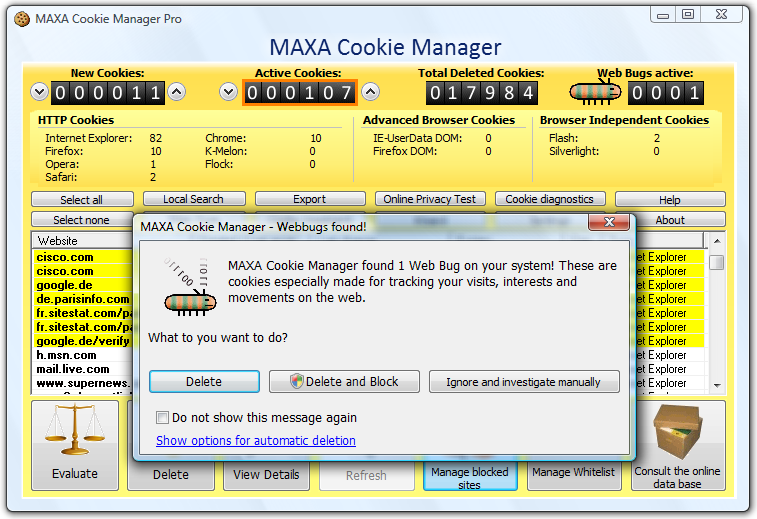 MAXA Cookie Manager works with Windows 98/Me/XP/2000/Vista/2008 and Windows 7 (both 32 bit and 64 bit Windows versions). MAXA Cookie Manager is available in English, German, French and Spanish (all included in the download). Qweas is providing links to MAXA Cookie Manager 4.2 as a courtesy, and makes no representations regarding MAXA Cookie Manager or any other applications or any information related thereto. Any questions, complaints or claims regarding this application MAXA Cookie Manager 4.2 must be directed to the appropriate software vendor. You may click the publisher link of MAXA Cookie Manager on the top of this page to get more details about the vendor.